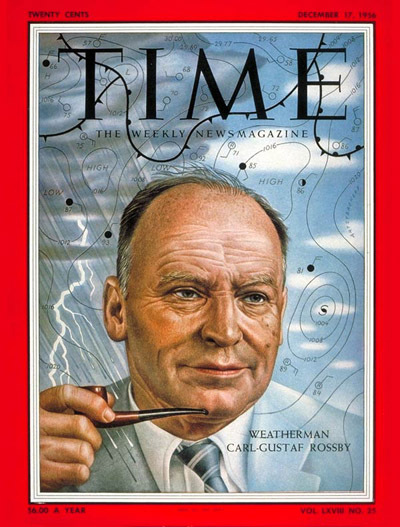 Time used a profile of Carl-Gustaf Rossby to introduce readers to 1950s advances in atmospheric science, including predicting the weather using digital computers. 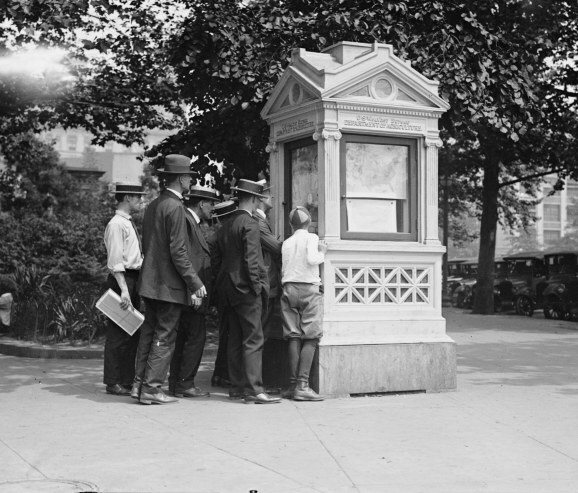 “So, who’s the Albert Einstein of meteorology?” an historian once asked me over a beer. There’s no obvious answer, which itself reveals something important about the differences between disciplines. 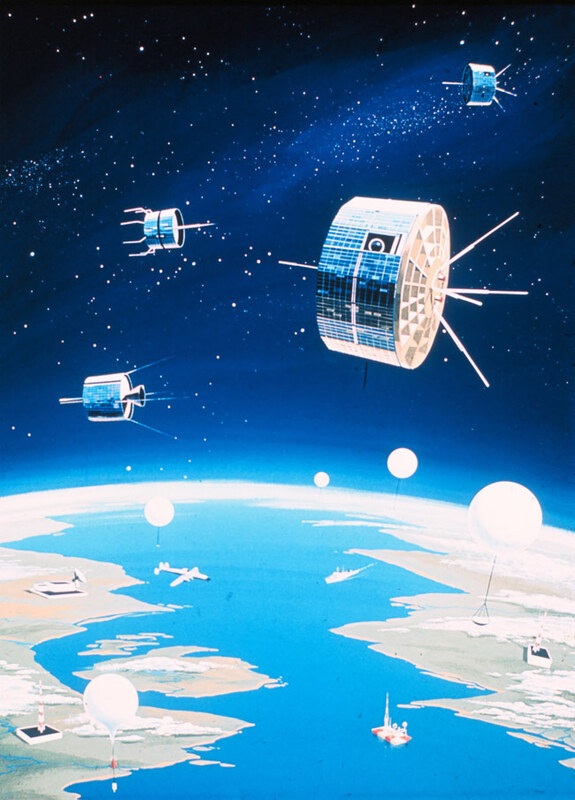 Genius theorists matter less in atmospheric science—where progress has more often come from new observing technologies, advances in calculating capacity, or the expanding geographical scope of coordinated data collection. Not all sciences are like physics. But if there were one 20th century meteorologist who combined the theoretical insight, charisma, and historical timing that made Einstein an icon, it would be Carl-Gustaf Rossby. Oral history is my favorite way to meet Rossby, who died in 1957. Rossby stories are sprinkled like chocolate chips throughout the transcripts of the Tape Recorded Interview Project supported by the AMS and UCAR since the late 1980s. Here are some sweet ones. Phil Thompson: Of course, Rossby was legendary as a spellbinder and I was completely taken in. I went away from that lecture thinking that meteorology was the most interesting and the most challenging field of science there was. Up to that time … I had no contact with the science of meteorology as such, at all. Joanne Simpson: One of the things that I admire in retrospect about Rossby, that although everybody thinks that Rossby was a theoretician, he actually also believed in being an observer and being a naturalist. 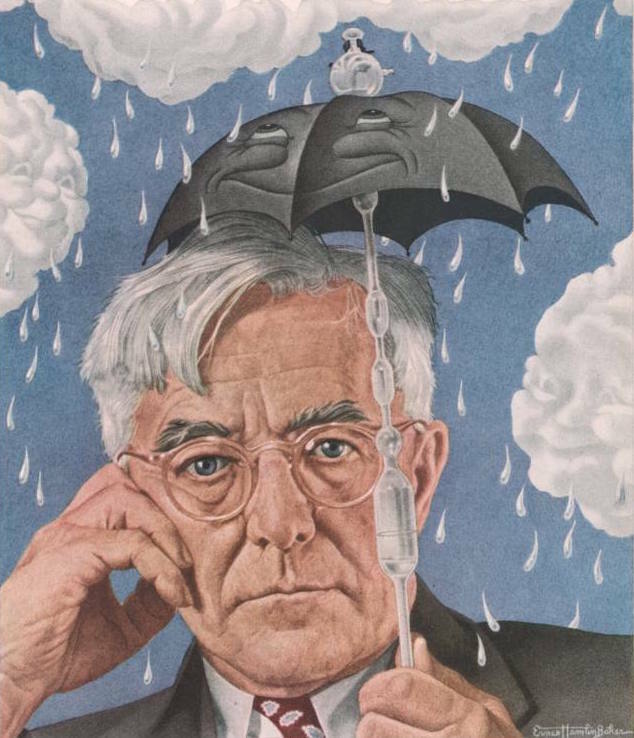 He had a strong requirement, or at least recommendation, that everybody who was going to get a Ph.D. in meteorology ought to be either a private airplane pilot or glider pilot or a sailor. George Benton: I remember when I went into his office, sat down at his desk and we were talking about what I would do and the phone rang and he picked it up. It was someone in Washington wanting some information. He said, "Oh, yes, I'll get that for you," and put the phone down and went off to get the information for the person on the other end. I don't know who it was. He was gone a long time and he came back and I think he was surprised to see me there. He had sort of forgotten that I was there and then he looked very quizzically at the telephone and said; "What's this?" and he picked it up and said, "Hello! Hello! Oh yes, I was going to get that information for you", and he put the phone down again and went out. ... That was typical Rossby. Horace Byers: In 1928, I received a call from the Chief Engineer of the Port of Oakland telling me that there was a man by the name of Carl-Gustaf Rossby, a very congenial Swede … He was looking for a meteorological assistant. I accepted the position and Rossby and I operated the model airway of the Daniel Guggenheim Fund for the Promotion of Aeronautics on the airway between San Francisco, Oakland and Los Angeles. Athelstan Spilhaus: I decided that if I was going to go into the airplane business, I had better understand the medium. So after I graduated, and took one degree in aeronautics [in 1932], I went upstairs in the Guggenheim Building [at MIT] and there was Rossby and his meteorologists, a wonderful little department with about as many professors and instructors as there were students. But both professors and instructors were excellent and students were excellent. The names of my fellow students, they're well-known in meteorology, great people. You mentioned Horace Byers, later of Chicago, Jerome Namias, R. B. Montgomery, an oceanographer, Chaim Pekeris, a very great theoretician--these were my fellow students, so the whole atmosphere was absolutely stimulating. I always think of Rossby as being a man among those who shaped my life. And the lives of many others, I'm sure, in meteorological business. Rossby's meteorology was often intertwined with aviation. Rossby (right) was among the Weather Bureau meteorologists who assisted Navy flyer Richard Byrd prepare for a transatlantic flight in June, 1927. Photograph taken by Fotograms news service; scanned from a print in Roger Turner's personal collection. George Benton: I don't think that the people of tomorrow will really appreciate the role that Rossby played in those days, because if you look at his publications they were good but they were not so tremendously outstanding. If you take his early paper on Rossby waves for example; it was an interesting paper, one that was quoted over and over, and over again, and one that is regarded as a "key paper". It was full of over-simplifications mathematically that simply did not have to be taken. … But this was the way he worked. He had an idea he wanted on paper, he got it on paper in the simplest way and went on to something else and immediately afterwards of course dozens if not hundreds of papers were written extending what he did making it more rigorous mathematically, putting it on a rotating sphere instead of it on a beta earth on and on and on. But they all followed directly from the germ of the idea that Rossby had so that he was very much a source of ideas. Horace Byers: Through people at the Department of Agriculture, they were greatly impressed with Rossby. They had talked about the possibility of Rossby as Chief of the Weather Bureau [in 1938]. But he had just been declared a U.S. citizen, so they didn't think that was proper. In 1940, Rossby left the US Weather Bureau to establish an Institute of Meteorology at the University of Chicago. There he organized the program that trained the weather cadet generation: more than 6,000 new weather officers for the US military. George Benton described this as the "explosion in meteorology." 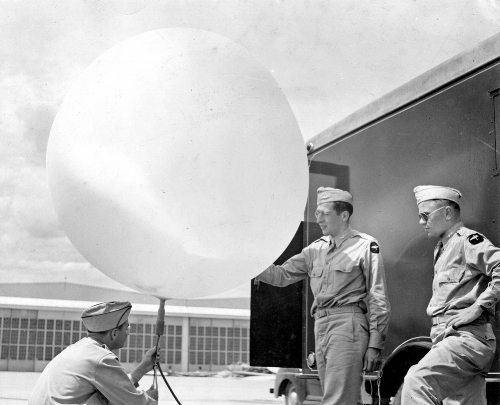 Here, three cadets at Chicago practice filling a weather balloon. Image courtesy of the University of Chicago Photographic Archive, apf3-02893, Special Collections Research Center, University of Chicago Library. George Benton: Harry [Wexler] suggested that perhaps I ought to go out to Chicago and go through the 9-month intensive training program in Chicago and then stay on there and teach. …. And I remember very well Harry handing me the phone and Rossby saying only one thing to me, "When can you be here?" And I told him, it was probably on a Thursday or so, I said; "Well, our group in Soil Conversation Service is breaking up,” … and I said, “I could probably be there a week from Monday." And he said, "That is too late (which was 10 days), we are starting a new class and I would like you to be in on it; Can you be here next Monday?" (which was about 4 days). … So I told Rossby, fine, and up and left with two or three days to go to Chicago, and that was really the beginning of my professional association with meteorology. Verner Suomi: He was a wonderful teacher. You see, what he was able to do which most of the other professors were not able to do as effectively as he was able, and that is, he would present the problem verbally. Then he would present the problem graphically. And you could see the solution, graphically. Then he would present the problem mathematically. But the mathematics came LAST, not first. Very effective teaching. I remember his going pretty fast through a lecture and he had a piece of paper in his hand in which he seemed to be looking at. He just crumpled it up and threw it onto the table there, so after class I went up and grabbed it. All it said on there was, "Today, do not talk about turbulence." Horace Byers (right) during the Thunderstorm Project. Byers kept many of Rossby's grand plans running smoothly. They worked together for more than 20 years, first in California running an airline weather service, then at MIT, in the US Weather Bureau, and finally at the University of Chicago. In 1956, Time described Byers as "the backstop to a genius." Horace Byers: C.E. Buell, with the stimulation of American Airlines, came to me and Rossby and said that the time was right when we should set up a thunderstorm investigation project. In the more or less spontaneous way that Rossby had, he said "Horace, you organize it and do it." I was a little aghast, it seemed then that the powers-that-be in the Senate and various places saw to it that money was appropriated to the Weather Bureau to set up a research project on thunderstorms. I think the Congress appropriated a sum of $125,000 to the Weather Bureau, which seemed like quite a bit of money in 1945, or whenever. C. C. Wallen: Carl-Gustaf Rossby was well-known for his ability to convince authorities for the need of further development of meteorology, and for funding. Chester Newton: There was a restaurant, a famous gourmet restaurant in Brussels called l’Epaule de Mouton … Palmen had confided to me that after I got my PhD that it had been in fact awarded in l’Epaule de Mouton. These guys were great on eating wonderful food, drinking wonderful wine, finishing with a cognac and a cigar. And that's where the real serious business got done, and I think it was decided between Rossby and Palmen, and Byers, that the time had come when I could get my degree. Joanne Simpson: I had originally started doing my Ph.D. with Rossby, who had been my Master’s supervisor. But firstly, he was very unencouraging because of the woman situation and he didn’t think there was any future at all for women in meteorology. Then I was trying to do the kind of dynamics that he and Victor [Starr] and George Platzman and the others were doing. I wasn’t very good at it, and I wasn’t very interested in what I was able to do. C. C. Wallen: The visit of Jule Charney was, indeed, a special one, typical for Rossby. Jule Charney was on his way from Los Angeles, where he had just published his doctor's thesis, to Norway on a fellowship, to study with the successors of the people of the Bergen School. ... Charney got a cable from Rossby before he left Los Angeles, asking him to stay over in Chicago for a few days. In fact, he came and he got off the train, when Rossby said, "Well, OK, please go and see Erik Palmen because he has a big apartment and you can stay there for a while." He went, and he moved in, together with his wife, Eleanor. Then he and Rossby started to discuss Charney's thesis, and Charney started to participate both in our map discussions every afternoon and in the more secret conferences on numerical forecasting that had started. ... Charney therefore stayed on and on and on, as Rossby didn't want him to leave. He stayed for more than half a year before he continued to Norway. Norman Phillips: I had participated with George in the second ENIAC expedition sometime probably in the spring of '51. So Charney knew me and I had had an opportunity in early '51, before I heard the Eady paper, to present my ideas to members of a brief meeting with Rossby and Charney in attendance, and told them that I was having difficulty. I wanted to get the instability formula but the fact that the coefficients depended on y presented mathematical problems that I didn't think I could solve and they said "well, why do you have to allow for that?" They more or less encouraged me to be very bold with that one. Then the instability formula came right out and then it was possible to compare that with Eady's. The things that I short-circuited in that way later on were the things that should have been short-circuited according to the formal quasi- geostrophic theory. … I remember being elated. Ferdinand Baer: And so he came in quite regularly and visited, and I can remember sitting in [George Platzman’s?] office as a young student, just quietly watching the interaction between [Platzman?] and Rossby as they discussed deep philosophical and scientific problems. Marveling at these people, but at that time I had no idea who Rossby was or of his reputation or anything, you know, I mean it was just so like he was there, and I was there and I’d listen to—I doubt very much that like in my older years where I interrupt everybody and always had something to say. I doubt if I ever said a word. C. C. Wallen: Another example of his generosity of--this was a small thing--was when I asked if he could loan me $30 for my trip back to Sweden after the end of that year, because I had exhausted my money completely ... He said, "$30? What amount is that?! I write you a check for $50." He did, immediately, wrote me a check for $50. "But, for God's sake, don't cash this check before the end of the month because there will be nothing in my account before they put in my salary!" Joanne Simpson: A lot of people move into a different area when they retire, or they go out and play golf, or go out fishing. I don’t have any interest in doing any of those things. My greatest wish would to be like Grady Norton, who died of a heart attack while forecasting a hurricane; or like my early hero, Rossby, who keeled over and died in the middle of giving a seminar. I don’t like the idea of when I won’t be a meteorologist anymore. It’s just inconceivable to me. All quotations above come from the transcripts of the Tape Recorded Interview Project, preserved and made accessible by the UCAR library system. Each speaker's name links to the transcript pdf. I want to thank the archivists, especially Diane Rabson, who have put countless hours into making these interviews accessible. Horace R. Byers, “Carl-Gustaf Arvid Rossby, 1898-1957,” Biographical Memoirs of the National Academy of Sciences, 1960. James Rodger Fleming, “Oysters, Beer and a Meteorological Breakthrough,” Boston Globe, April 17, 2016. James Rodger Fleming, Inventing Atmospheric Science: Bjerknes, Rossby, Wexler, and the Foundations of Modern Meteorology (MIT Press, 2016). Kristine C. Harper, Weather by The Numbers: The Genesis of Modern Meteorology (MIT Press, 2008).